Windows 7 has been officially released by Microsoft today – Oct 22nd. I still run Windows XP SP3 on my 5 year old desktop and it runs like a champ. I never upgraded to Vista as i knew how resource hungry it was. My wife has been running Vista on her Sony Vaio and it performs fine as that laptop has enough horsepower. Windows 7 is supposedly a little less of a resource hog than Vista and expected to perform better in a low powered hardware. So, I am looking forward to making the leap from XP once my Windows 7 pre-order arrives today. 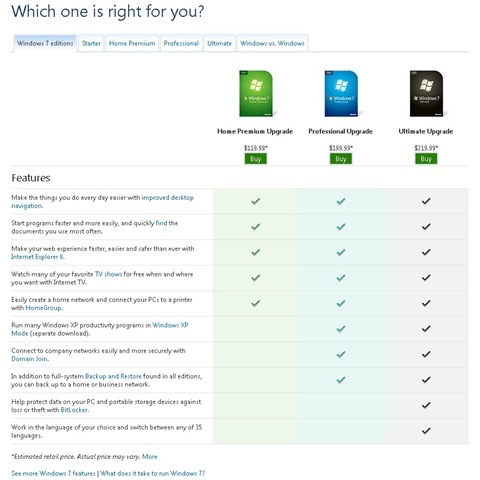 Windows 7 is available in 3 flavors – Windows 7 Home Premium, Windows 7 Professional, Windows 7 Ultimate. 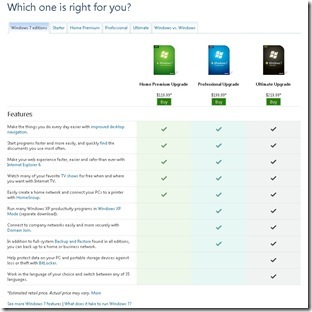 You can see a comparison of different Windows 7 features based on editions here. You can also click on this image to see a full size image of it. Also, you can check out a bunch of product features videos here. Celebrating the arrival of Windows 7 some vendors offering their premium anti-virus products for free with 1-year subscription just today. It’s a good time to grab one of these premium anti-virus solutions if you don’t have one or use a free one. If you are looking to get a good grip on Windows 7, here are a few good articles I came across in the last few days. If you are planning to upgrade, this should be a good starting point. I will try post my own experiences here once I do it. So, are you planning on getting Windows 7? If yes, are you upgrading from XP or Vista? I ran Vista for over a year and been running Windows 7 for about a month and really I can’t tell much of a difference. Yes the “Start” and Task bars are different, but the other 98% is just Vista with a different name. My 2 cents says this is just Microsoft PR to get away from the bad taste that everyone has about Vista. I have pretty good hardware and never saw a difference in performance. So it will be interesting to see how it fares on less horsepower. I’m still torn as to whether to invest in Windows 7 – sure Vista is hideous compared to XP but is 7 really that much better? I also read yesterday that they’re already working on Windows 8! .-= Clare Swindlehurst´s last blog ..Tiana’s Showboat Jubilee! comes to the Magic Kingdom for 10 weeks only =-. Thanks for all small tips, I use windows 7 on my Macbook Pro alongside with snow leopard, it works great!